At the Orchard Lake St. Mary’s Polish Country Fair. 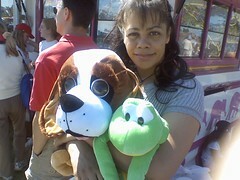 Doug won these for me. He’s two for two at the carny games. We’re calling the dog Andy Rooney. The frog needs a name still.